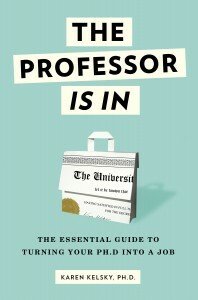 Today we are honored to have a guest post by Kathryn Hume, Edwin Erle Sparks Professor of English at Penn State University and author of Surviving Your Academic Job Hunt: Advice for Humanities PhDs (revised edition, 2010). Once upon a time, dissertations were “available” through UMI as microfilm or through Interlibrary Loan as bound copies. In either case, you knew that you were not supposed to quote from the document or use its ideas without permission from the author. In the case of a hardbound copy, the libraries had records of the borrowers, so misappropriation could, in theory, be traced. Since you knew the material was unusable without permission, you felt free to ignore dissertations, except to make sure that a recent one was not too similar to the one that you hoped to write, lest it get published before yours and scoop you. Yes, such documents were technically “available,” but they were definitely not published or easily consultable. I disagree profoundly on a few points here, and these will annoy many people! The first that comes to mind is that a dissertation is not a book; however brilliant your dissertation is, a publisher will probably want something very different. Publishers want something that will sell and the conceptual scaffolding which you carefully constructed to “show your workings” to a dissertation committee will go to 2 footnotes and the bin. A good publisher knows that what they can get out of you 2 years after you complete the dissertation will be a much better product that the dissertation. Secondly, I don’t accept the point that a dissertation has no or inadequate quality control. It has a different sort of quality control to the double-blind reading a publisher will give it, but it still the output of an examination process, and if it is not good enough, then you should not have passed. The third issue I have is that this is grounded in assumptions about the dissertation-publication-tenure path which no longer hold. The old Phd-published monograph-tenured post track is broken at several points. Phd output in many disciplines exceeds the pool of academic jobs, so many Phd grads will no longer get academic posts, and many dissertations will never be published. If they are not online, they are dead. Realistically, given the competition out there, if the bright core of your thesis is not already on the path or publication in a peer-reviewed journal, you won’t even make a shortlist for an interview – as far as I can see, book plus two articles is now the minimum in many fields. Articles are much more serious competition for a book than a pdf on any repository, but they are also some evidence that the person has something to say, so it cuts both ways. Publishers have priced monographs out of the marketplace. I’ve seen monographs routinely priced at anything from €65 to €150; that represents an unjustifiable slice slice of my share of the library book fund; and if I can’t justify buying a copy, it doesn’t go on my class booklist and I don’t cite it. Thanks for the warning (although I am long past being able to take it). That said, does this beg the question of whether using publications as criteria for tenure needs to be reconsidered? Perhaps we need peer-reviewed on-line journals — I believe there are quite a few already in existence — run by people who recognize the difference between the two uses of “free” regarding information (hint: it isn’t the same as “free beer”). In my opinion, this system needs to change, and while warning people about how their careers could be damaged by being “published” on ProQuest is valuable, it also tacitly supports a system of scholarship that may be badly in need of change. I agree the system has to change and probably is, as we speak. I just hope, while expectations are in flux, that the tenure casualties are kept to a minimum. This is a really interesting post and discussion and I hope it gets more exposure — although the issue may be being discussed more widely than I realize. My university requires ProQuest and we’re all horrified. I see Mike and Scott’s points but not to have a choice in this matter is really irritating. It’s one thing to have it in Ann Arbor microfilm but up online in dissertation form is too much of a violation, feels like robbery. I know this is a year old, but I’m hoping for a reply…. In Canada, we’re pretty well required to sign permissions for ProQuest to have our dissertations. How can one undo this? You seem to imply that one can assert one’s copyright to the detriment of ProQuest. But how? Oh dear, thsi was a guest post. I know nothing about ProQuest from personal experience. I’ll check with the author and see what she says. From Prof. Hume: “I said nothing about copyright. I simply said that Proquest admitted that one could remove something, and the graduate school here proved helpful and helped four students remove theirs. I do not know how Canadian law fits in; where I ran into the most important hurdle was the sense of the grad school that as a semi-public university, our research was supposed to be available to the public. However, given the info on how this could affect publication as a book and given the word I had from another school hammering this out that a press had refused to consider something unless it had been removed from proquest, the grad school at my institution backed off on demanding that. Thus, the undoing will have to be through the individual school. > renewal date on the back of your hand, with room for subsequent dates to be added. For what it’s worth: though the ProQuest form distributed by my graduate institution, which I was required to submit along with the diss, had only 6-month, 1-yr, and 2-yr embargo options, I simply sent a letter to ProQuest, along with the form, saying I wanted an indefinite embargo. And ProQuest has thus far honored this for almost three years with no need for renewal. Also, although some schools require that a diss author not set a ProQuest embargo for longer than a specified period, it’s not clear to me how that school could enforce this once a Ph.D. recipient is no longer a student there. For instance, my current school is now considering requiring graduates to get approval from their former diss advisors in order to extend an embargo. But, aside from degree revocation, what mechanism would even be available to an institution in order to compel a degree-in-hand graduate to allow ProQuest to post the work? This post makes me sad because when I was in college I loved looking up dissertations on ProQuest. I found all my professors’ (at least the abstracts) and read about half of them (one of which got me through a really fun trip that unfortunately had a lot of downtime and no internet). I mean, I get why someone might not want them up there. But I liked them, often better than the “officially” published books. I agree with Eileen. Having dissertations online allow others to read about the academic work of others in their original, honest form. wow, great work, really appreciated . As someone who has never managed to land a University post despite having good grades and some (I hope) interesting research., I look to free online publishing as a means of sharing ideas before they become completely superseded. Like some of the commentators above, I find the “exclusiveness” of some academic work (i.e. pay-to-see journals etc) sad and self-defeating. It makes it difficult to research online. Surely it only ends up increasing the gulf of general ignorance, and does little to improve access to whatever the scholar in question laboured to achieve? Also, finances aside, what is the point of research unless it is trumpeted loud and wide? There may be some chance of plagerism, but that in itself is flattering (a good idea beckoning imitation), and ultimately other researchers do find out who the “original” source was, so it is hardly a permanent scar. I hope I am endlessly plagarised as what a boon that would be if something I ‘discovered’ spread like wildfire!! I want to comment on libraries keeping borrowing records of patrons–they don’t. Not routinely, at least. The profession wouldn’t stand for it, and while certain things have to stay in the system for a certain period of time (you wouldn’t want to return an item and find the system had already lost the record), the info is dropped as soon as the transaction is complete. Any stats that are kept (circulation numbers, for example) are not related to individual user accounts. If a dissertation has been successfully defended then it has had a rigorous peer review. Virtually every dissertation worldwide can be loaned from the relevant university, often scanned and distributed electronically and cited in the work of others. But it can take months and is very bureaucratic. But there is no reason to grant a giant corporation exclusive rights. After all, the hard work is your copyright and something you should be proud of. I advocate the hard copy printing (on demand) of any thesis that might be cited in future publication. Why continue to see your work referred to in footnotes as ‘(unpublished) PhD thesis, University of ****, 2000’, or similar, when it can be cited clearly as a reprint of the thesis and you can even make a few bucks by selling it though Amazon? Many European universities demand print publication of a thesis – as is – after it has been publicly defended, and you will have to cite the source of any subsequent reworking of the material for journal or monograph publication in any case, so don’t pretend it doesn’t exist. There are lots of deserving theses from the 1980s onwards in many disciplines that could do with wider readership. So, why not? I know this has been a while, but I am getting depressed now and I need some help. I finished my dissertation about two years ago and after making a few revisions to it I submitted it to an academic publishing house who had a call for books on my particular area of expertise. I sent the manuscript to them and after an initial positive response it went to the managing editor from whom I am waiting to hear back soon. In the meantime, I was browsing their website and with horror I discovered that they charge the author 10’000 Euro for a flat rate to get book out. How on earth do post-docs on a miserable salary get that amount of money to pay for a publication? I understand that the publishing house has to pay their employees etc, but 10’000 Euro?!? Isn’t it completely absurd that after 5 years of working our asses off, we, as authors have to pay on top 10’000 Euro? I find that simply depressing. Any ideas on how to get a book published without spending thousands of Euros/USD? Any tips on how to negotiate that or get funding to publish your dissertation? In Germany you are not entitled to your Dr. title unless you have published your dissertation. For the working poor online publishing through the university library seems like the only option. Help! I turned my dissertation into a book and am at the last stages of publication. The publisher is asking if this was a dissertation. Although I retained the title, I have rewritten and rewritten… do I need to check the box that says it is a dissertation and mentions the university? Thanks for any help!! I must say this article is good one and open ones eyes. I too have published my thesis online and thinks it is good to share your knowledge with people. I used the following facility to put my thesis online. I agreed with Leonard Cassuto. You should opt for University platform only to make your dissertation available online. Pardon me for asking again? Basically, harmful. for the reasons explained in this post. Perhaps there are different cases for “Yin” knowledge such as Ph.D dissertations in Humanities, Arts and Social Science, Psychology, Law, Economics, Business as opposed to “Yang” knowledge in Ph.D dissertations in sciences and technical knowledge ( Engineering, Medicine, Computer Science, etc..). I also want to confirm what jes says above about libraries not keeping borrowers records of what they borrowed. This is true, although it does take time for such records to be purged from the system. Furthermore, even if the records are available, no librarian worth his/her salt would EVER let you know who borrowed it previously. That would be completely out of line with the library code of ethics. What about self publishing your dissertation or thesis as an e-book on Amazon? The hearsay (‘Oh I heard that someone was told they couldn’t get published’ that is cited in this article is not evidence. There are far better evidence-based investigations of these vague fears, most of which show that they are unfounded. Hiding research that you were funded to do, because you are afraid you won’t get tenure, is ethically wrong. More and more funders now require the results of research they’ve funded to be made publicly available, and rightly so. The avaricious, selfish attitude of this post will do harm to humanities as a discipline, as will a refusal to make research openly available. On a related note, what is your advice as regards sharing the PhD dissertation in response to requests by scholars in your field, if one has a book forthcoming next year? Should one say, I will arrange for you to receive a review copy of my book or share the PhD straight away? If one shares the PhD should one ask for this to be referenced as the forthcoming book or as the dissertation?